LINCOLN CENTER— Fashion Week has historically boasted a swirl of beautiful models, cutting-edge fashion, and luxe goodie bags — but some fashionistas say that that the riches given away at previous events are quickly becoming a thing of the past. "A few years ago I would come home with so many gifts of make-up, perfume, clothes, and jewelry that my boyfriend had to help me unpackage and sort them," said fashion blogger Liz Black. "This year is a bit skimpy." Fashion blogger Yanil Flandez agreed. She has been going to shows for nearly six years and said that the bags for VIPs used to be filled with expensive gifts like sunglasses, Bulgari wristwatches, diamond earrings, and leather bags. But according to Flandez, these days attendees are lucky to get a bottle of nail polish. "The gift bags have definitely changed," lamented Emily Bache, blogger for Wanderlust Fashion. "These days it seems the bad economy has hit the fashion world too." Among the shrinking number of freebies still dished out are fashion magazines, Pepsi, granola bars, water, vodka cocktails and Prosecco. Fashion Weekers can also get free professional hair stylings and have their pictures taken on a mock red carpet and sent to their email. Still from complimentary champagne in the lounge to little gift bags full of anything from make-up to condoms, many attendees still scramble to grab whatever they can get. "People love anything they can get for free," said Flandez. "It's just a fact." Those in the know said there were a few standouts among this season's goodie bag giveaways. Designer Katya Leonovich gave away scarves in a print reminiscent of the styles in her show, Reema Acra gave away bottles of perfume and Joanna Mastroiamni gave away nail polish. 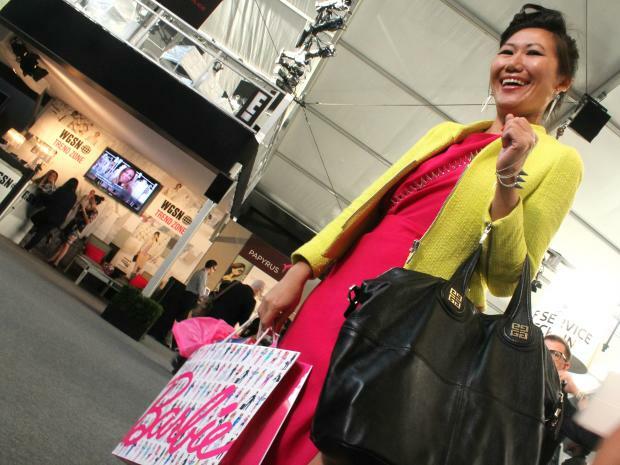 The biggest gift bag buzz was generated by Designer Chris Benz's pink bag holding a "Barbie for President" doll given out at his walk-through presentation. "This will make a great gift for my niece," said Black. Anticipation was also high for Betsey Johnson's show taking place Tuesday night not only because she is a beloved designer, but also because she is known for her extravagant gifts. "I once got a make-up bag from Betsey Johnson that was so big it lasted for years," Black said. "This could be her last show so the gifts might be off the hook."